Here at the MajestiCrest WebRing, we will STRIVE to make it easy for you to get in contact with a good, RESPONSIBLE breeder if you want, provide you some great links to pictures of Cresteds, or even just put you in contact with Crested Owners. Most of us will be more than happy to be of service to you, whether you just want some information on the breed, or you are looking to see what's out there. If you want, you can check out our classifieds sectiion to post an ad, our chat room to be able to get 'live' answers, and the many other services that we provide to you on the Extras page! A lot of people look don't look at the Chinese Cresteds enough before they decide to purchase one. They don't know what kind of health problems they are prone to...they don't know things about their character (like how hard they are to housebreak! ), and just buy them because the are 'cute' or 'unusual'. 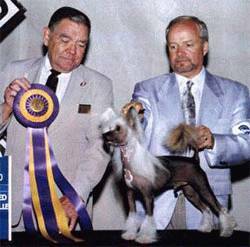 PLEASE, before you buy or adopt a Chinese Crested, find out EVERYTHING that you can about the breed. They can be wonderful, loving pets in the right hands, and we want them to flourish! Just so you know, this WebRing fully supports the adoption of Chinese Cresteds. We truly wish to give them all a second chance...and if you think that you can do this, please visit the Crest care website (see the link on our cantact page) and see what you can do to help these wonderful pups! Please sign our guestbook! We appreciate all of your comments, and hope to start up a mailing list, soon!